Friends of Fort Plain Inc.
Diefendorf Hall Cultural Heritage Center in downtown Fort Plain, New York. Erie Canal Exhibits, Local Artisans' Gallery, Meeting Place & Shop. Diefendorf Hall is located at 47 Main Street in downtown Fort Plain and is listed on the National Register of Historic Places. It serves the community as a cultural heritage village center housing local history relating to the Erie Canal, village memorabilia, work of local artisans and public meeting space. Friends of Fort Plain is a volunteer community group and a not-for-profit 501 C 3 organization, incorporated in 2008, working to preserve the heritage of the village. The group uses Diefendorf Hall as the center for its activities and welcomes visitors, supporters and volunteers. “History happened here”…The completion of the ERIE CANAL in 1825 was largely responsible for the expansion and present day location of the Village of Fort Plain. Serving as a canal shipping point and the center of the fertile farming region, the village enjoyed prominence as a trading and commercial center. Diefendorf Hall, as it was familiarly known, was built by John I Diefendorf. The adjacent family home also housed guests and became known as Diefendorf Inn. 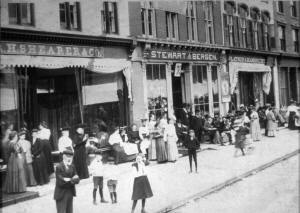 The Hall was built only feet away from the original Erie Canal at the center of the developing commercial area. The 1860’s Italianate structure complements a row of similar commercial and residential structures on the south Side of Main Street. It is located opposite Canal Street and remains a prominent reminder of the grandeur of an old American Erie Canal town. This building is reported to have been a mercantile with a second story ‘Music Hall’ where the third floor was used for storage of canal shipments. The second story ‘Music Hall’ was reportedly used for social gatherings, lectures, recitals and shows. The building is historically significant having hosted Women’s Rights Movement leaders, Susan B. Anthony and Elizabeth Cady Stanton in 1867. Mark Twain also visited Fort Plain in 1868. In the early 1900’s Diefendorf Hall was remodeled into a theater. The second floor was removed and a wide stage and mezzanine area was built to accommodate the Rialto Theater. This space hosted musicals, dramatic productions, vaudeville shows and early movies. After languishing another decade, the American Legion purchased the building in 1933 and turned it into a center for social activities hosting sports banquets, wedding receptions, community dances and public events. As the economic fortunes of the Village turned, the building experienced several transformations housing various retail stores on the ground floor through the mid 1990’s. The former Diefendorf Hall remained empty and neglected until it became a community project for the Friends of Fort Plain. 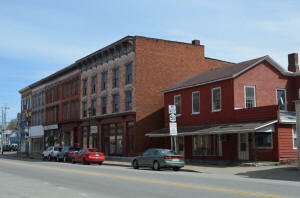 It is now regaining its prominence on Main Street as a Cultural Heritage Village Center in the Mohawk Valley Villages Region. The Friends of Fort Plain and community volunteers are a group of local residents working to preserve the cultural heritage of the Village. Vision: Return Diefendorf Hall, located at 47 Main Street in downtown Fort Plain, to social, cultural and educational prominence. Goals: Restore the structure and use it as a public gathering space and local attraction. Completed Cultural Resource Survey of the Village with assistance from Preservation League of NY State. Facilitated Village of Fort Plain's Nomination to the National Register of Historic Places and creation of local Historic District. Obtained long term lease from Village of Fort Plain. Prepared building for renovation. Supported by local Yerdon Foundation and fund raising activities. 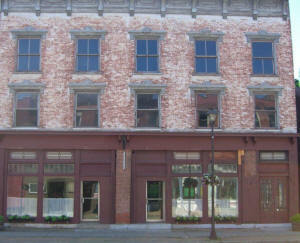 Recipient of grant funding from Preservation League of NYS, Montgomery County Economic Development Office. I Love NY, Parks and Trails, NYS Department of Environmental Conservation.